We all hate when insects start living and breeding in our homes, and gnats are just one of the many species that can infest our living spaces. There are a number of flying insects, and they can be biting or non-biting (gnats are usually non-biting). The male gnats assemble in large mating swarms, making them even more annoying. So, the question is: how do you get rid of gnats? There are a number of solutions you can try. First and foremost, you need to know what causes a gnat invasion, how you can prevent them from entering your home, and how to get rid of them. Gnats are attracted by moist environments. Humidity and moisture are the leading reasons why they enter your home. Fungus is another reason they enter your home, as fungus is their favorite food. Damp places are the best breeding ground for gnats. They lay their eggs in ponds, potholes, and any wet areas they can find. Logging of water around the pipes and/or drains attract gnats due to the moisture. Poor sanitation, improper disposal of garbage, and untidiness are music to their ears. The messier your home is, especially the roof, the more gnats there will be. One of the best ways to eliminate gnats is to place some traps around your home. But one thing you need to consider is where to put these traps. The most effective way is to locate the source—their breeding ground—and place the traps there. For example, if the gnats in your home are drain gnats, make sure to apply traps and remedies for the drains in your home. Please note that not all of these methods will offer 100% success for everyone. Some will experience success with one type of remedy, others with a different trap. However, I highly suggest trying these traps for eliminating gnats. When you mention gnats, vinegar is the first association. The vinegar trap is the oldest trick in the book, and one of the most common traps people use. For most people, the vinegar trap is the go-to method to get rid of gnats. What you need for this trap? A container, some dish soap, apple cider vinegar, sugar, and water. Start by putting two tablespoons of apple cider vinegar in the container. Add 1 tablespoon of sugar, some dish soap, and 1 quart of water. Mix all the ingredients well, and then place the container close to the infested area. All of the insects will be attracted to the smell of the ACV and fly into the liquid mixture, after which the gnats will die. You can place several containers around your house. This is less of a trap and more of a means to get rid of gnats. But this one works only for your sink. When you are dealing with drain gnats, bleach is one of your best friends. Keep in mind that sometimes pouring bleach into the sink won’t get rid of all the gnats, as there are gnats that are breeding deep into the drainage system. And you cannot straight up pour bleach into the sink; you need to dilute it with water first. I must also stress that you should wear mouth and eye protection when pouring bleach into the drain. Here is another trap that you can use to eliminate gnats. The red wine trap is also a very popular solution, as the wine attracts gnats due to its scent. It’s just that some people prefer to drink their wine, and not waste it on insects! You need red wine, a small container, and dish soap. Oh, and any cheap red wine will do the trick. Pour the red wine into the container until it is three-quarters full. Add a drop of dish soap, stir the mixture, and then place it close the breeding source. Gnats will be attracted to the wine, and then fall down into it. 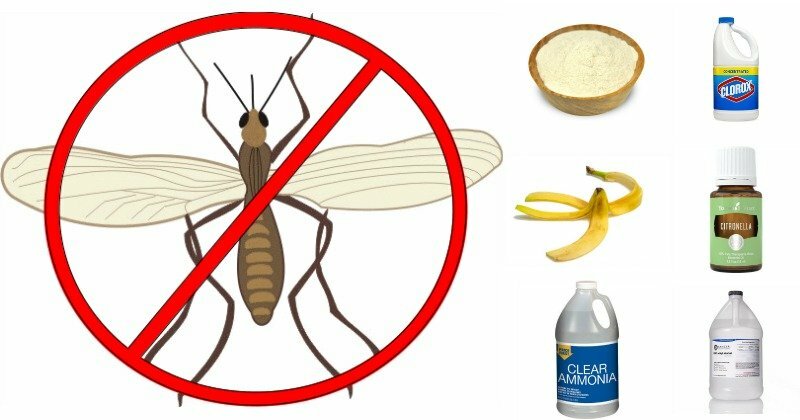 This is another remedy you can use to get rid of drain gnats. As with bleach, you can pour ammonia into the sink. However, never mix bleach and ammonia together. Doing that can cause a deadly toxic fume. 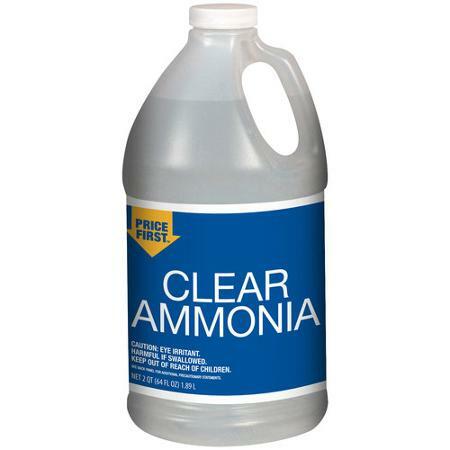 There’s no need to dilute the ammonia with water. When you pour it in the drain, leave it there for several hours. Note: because ammonia is toxic to humans, dilute it in the drain before using the sink again. If you can’t stand the smell of ammonia or bleach, baking soda can help you get rid of drain gnats. For this remedy, put three tablespoons of baking soda into the drain. Follow it up with a cup of white vinegar. Let it sit for few hours, and then run water through the sink. The good thing about this remedy is that you can use leftovers to make it! Instead of throwing away your banana peels, use them for an effective trap. Just take one jar, put the banana peels inside, and cover it with a plastic wrap. Poke a few holes into the wrap so gnats can enter it. The gnats will be trapped and glued to the banana peel. After they are in, dispose of the jar. If you don’t eat bananas, you can use any rotten fruit you have in your home. Add a few slices of rotten fruit into a container or a jar, and then close it with a plastic wrap. Punch a few holes in the wrap, let the gnats get in, and then dispose of the jar. You need a spray bottle for this remedy. Dilute alcohol with water, and then put the solution into the spray bottle. Spray all the areas where gnats are breeding and thriving. Not only you will get rid of gnats, but you will also prevent them from entering your home again. Another spray solution. For this one, mix citronella oil, water, and liquid dish soap. Spray the solution in your garden, near your trash cans, or even in your sink. The good news is that this solution doesn’t harm pets or plants. The scent of vanilla is repulsive to gnats—they run away from it. And that’s why you can use it to your advantage. You need pure vanilla extract. Mix 10 ml (.3 oz) of the extract with equal amounts of water. Stir well, dip a cotton ball in the mixture, and apply to problematic areas. Note: use medical gloves because vanilla extract can cause skin irritations. We’re moving on to other remedies that you can spray on troublesome areas, and lemon oil is the next in line. Similar to the other remedies, dilute the lemon oil with some water. Pour the mixture into a spray bottle, and spray around your home. Bonus points for giving a citrusy freshness to your home! This trap is designed for outdoor usage. The reason is simple: it repels eye gnats living and breeding in your garden. You need 4 eggs, water, a one-gallon container, and several one-quart plastic bottles. Crack the eggs in the container, fill it with water, and mix thoroughly. Add enough solution to each bottle so it fills ¼ of the bottle (save the remaining solution in the fridge). Punch holes in the bottles, and hang them in the garden. Check the bottles once per week, and change the mixture once every two weeks. As I mentioned at the beginning, the best way to eliminate gnats is to prevent them from entering your home altogether. Hygiene is the most important factor in preventing gnats. You can use all the traps you want, but until you change your lifestyle habits, and transform your home from a gnat breeding ground to a clean and tidy place, it’s all for nothing. Clean up all dirty dishes. Don’t leave them lying around in the sink. Never, ever leave dishes in the sink overnight. Make it a habit to clean the dishes after you are done with your meal. Get rid of trash bags and cover them. Make sure that your trash cans are well covered. Make sure there are no damp areas in your home. Check the kitchen and the bathroom, the two areas most prone to dampness. If there are damp areas, make sure to get rid of them. For your indoor plants, make sure to regularly change the potting soil. Invest in some high-quality soil that will keep pests like gnats away. Don’t pour olive oil or any other vegetable oil in your sink. Yes, it will help at first, but in the long run, this remedy will clog your drain. Be smart when watering houseplants. One of the biggest mistakes people make is overwatering. As a result, you get wetter and damper areas. And as I said a number of times, damp areas are excellent breeding grounds for gnats.